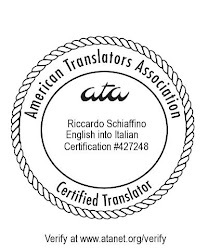 About Translation: Keeping our grammar current: Serianni's "Prima lezione di grammatica"
Keeping our grammar current: Serianni's "Prima lezione di grammatica"
Most translators have studied the grammar of several different languages. Paradoxically, sometimes we are most out of date with the grammar of our own native language. We studied it first in elementary school. Again in middle school - but usually skipping what we learned in the earlier grades. By high school, often we were done with grammar, shifting our attention to other linguistic subjects. Unless we continued specializing in our own language at university (perhaps studying to become a teacher), most of us never studied our own grammar again. Meanwhile we studied the grammar of a foreign language (or more than one). As we studied it later than our own, this knowledge is likely fresher. Without a conscious effort to keep current formal knowledge of our native language, we increasingly recall grammar notions through the fog of imperfect memory. We should not rely on the grammar book used when we were in grade school, either: grammatical knowledge and consensus change. We should learn what is newly acceptable, what was correct even if our primary school teacher said otherwise forty years ago, and maybe also the rule he clearly explained to the class - but that day we were too busy looking out of the window, and didn't pay attention. There are plenty of good works available for the Italian translator who wishes to brush up old studies or keep current with new notions. An excellent little book I've recently read is Luca Serianni's "Prima lezione di grammatica". Although not a comprehensive grammar (such as Serianni's own excellent "Grammatica italiana"), it analyses topics likely to interest the Italian translator, from the plural of unassimilated foreign words ("molti flash" or "molti flashes"? ), to problems of coherence and cohesion, and of grammatical accord of number and gender in writing. The book is well written, but demands some effort - Serianni uses technical terms as necessary, and I had to look some of them up. Some I didn't know, and some I only half recalled from studying grammar so long ago. Recommended to all Italian translators! As far as learning another language, is concerned, can I put in a word for the global language, Esperanto? Although Esperanto is a living language, it helps language learning as well. I don't think that Esperanto can be considered as a "living language" since, as far as I know, it is a language without any native speakers (i.e., without anybody who learned it as his or her native language - if you know of any parents who taught their child to speak exclusively Esperanto, please let us know). Esperanto is certainly the most successful of all artificial languages. Learning it is probably an interesting intellectual endeavor. Its usefulness for actual communication is, however, probably on a par with Klingon. Keeping up with grammar is essential in any language. It's great that you are reflecting on the need to stay current on grammar in your language. Although, I can't recommend an Italian grammar guide, I can recommend an English grammar book that is designed to refresh readers on the common misuses and recent changes to grammar rules, “Booher’s Rules of Business Grammar: 101 Fast and Easy Ways to Correct the Most Common Errors,” by Dianna Booher (McGraw-Hill, 2008). Its short chapters and memory tips at the end of each chapter make it ideal for a busy professional just trying to brush up and stay current. It’s also great for those who are studying English as a second language.